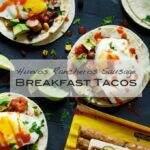 Done in under 10 minutes, these Huevos Rancheros Sausage Breakfast Tacos are the perfect reason to wake up excited on weekdays. If desired, heat tortillas (it should be desired). You can do so in the oven, in a nonstick pan, or in the microwave wrapped in a damp paper towel. Meanwhile, heat breakfast sausage according to package directions and chop into bite-size pieces. Double up tortillas (2 per taco) and top with breakfast sausage pieces, an egg, salsa, corn, black beans, and chopped avocado. Garnish with a sprinkling of queso fresco, cilantro, and hot sauce, if desired. Devour immediately. If you don’t have queso fresco, you can substitute with cotija cheese or crumbled feta.